The last few years have been very kind indeed to those who still fondly enjoy one of gaming’s most prehistoric art forms, the point and click adventure game. Leading at the forefront Telltale have impressed time and time again with their array of ambitious adaptations and so much so that indie efforts have been cropping up everywhere to bring about a much needed resurgence to the dying genre. One of these duly noted efforts is Resonance by Xii Games. Resonance is a complete package. While it emulates the classics of the past it offers a refreshingly alternative take with much needed fine tuning and innovation. 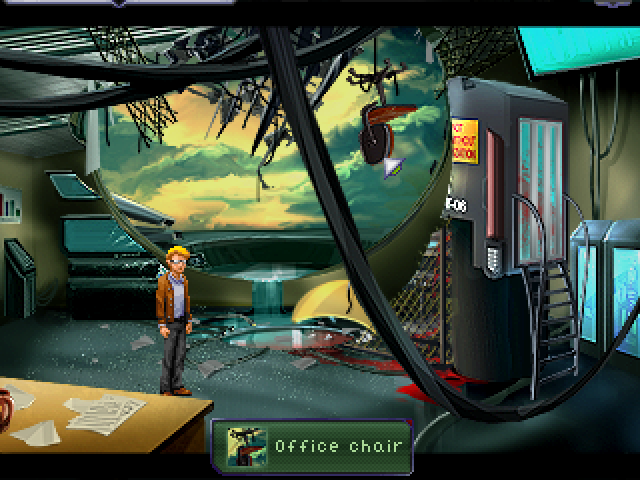 Resonance immediately drags you into the intriguing yet ultimately morbid tone of the setting from the very start as the modern world as we know it is plunged into chaos and anarchy. Mysterious and un-explained explosions are taking place across the planet and the world’s governments have no clue as to the origins of the global threat. The rest of the game’s story takes place 60 hours before the event leaving the player with the task of unravelling the mystery behind the catastrophe. Throughout the story the player assumes the role of four main protagonists whose lives have become entangled in the sinister truth behind the disaster and now must form an alliance if they are to succeed in their goal. Like any good thriller, Resonance does a fantastic job of slowly drip feeding new snippets of information while ultimately creating a barrage of further questions, this method helps to keep a consistent air of mystery and unease. They never feel like cleaning up do they!? Our heroes are believable and well written, offering a fair modicum of charm while giving their own unique perspective on the situation. This interestingly paints a very different picture on the overall story depending on who the player spends more time with. Relationships will be formed and broken and even the player themselves will be gripped by a bizarre sense of inner paranoia when faced with difficult decisions of who to trust and who to favour in the series of gripping events that run throughout the course of the game. Overall the plot of Resonance is direct, concise and very powerful indeed. You will be touched, occasionally laugh and at many times feel sick to your stomach. While some elements of the story could have been done with a little extra exposition it otherwise does a fantastic job of remaining compelling which will push players through to the very end. 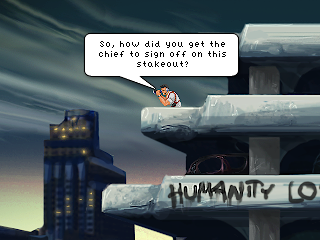 Resonance like many of its predecessors does very little to change the standard point and click control system. After all, if something isn’t broken why attempt to fix it? But in doing so Xii Games strives to improve on what is already there with some minor yet impressive modifications of their own. Firstly the game attempts to abolish the use of a HUD which in the past would have swamped the screen with a huge array of available yet mostly irrelevant options. Instead these interactive choices are tucked away during gameplay and take the form of Long Term Memories and Short Term Memories in addition to a standard inventory. Long Term Memories (or LTM’s) are important plot points that are automatically added when revealed which then can be used to recall upon at almost any time. LTM’s provide a subject to discuss with other characters but they also serve as a fantastic recap when coming back to the game after a long absence preventing the player from forgetting the current task at hand. Short Term Memories (STM’s) on the other hand are either people or immoveable objects in the environment that can be interacted with or used as a discussion point with other characters in the game. He's really just Pigeon watching. The most interesting and praise worthy addition is the ability to switch between the four protagonists on the fly which allows for an array of interesting opportunities. Each character processes different skills and will be needed to complete a task that no other individual is capable of doing. In some cases multiple characters can solve the same situation by either working together or by applying very different methods causing the game to split down multiple pathways and even alternate endings. This feature also tremendously helps the flow of the game and prevents the time honoured tradition of grinding to a halt when blocked by a challenging puzzle. Though despite the inclusion of some very difficult challenges Resonance is very short even for a point and click adventure. 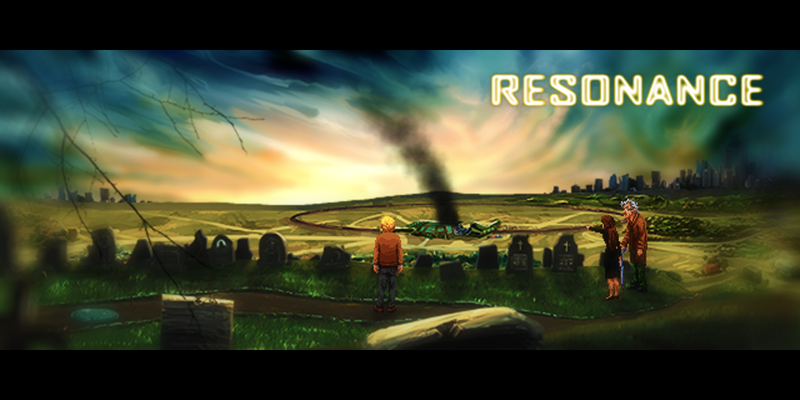 It is more than likely that most players will be able to complete the game in a single weekend but by adding the multiple routes and endings, Resonance has provided a very crucial element that has been missing from even the greatest titles in the genre, that being “Replayability”. Resonance sports a nostalgic visual style which will immediately hit an instant rapport with any long term fans of the genre. The sprite work is very well detailed and is simply stunning, proving that a video game can still look great without the need of extensive HD visuals. 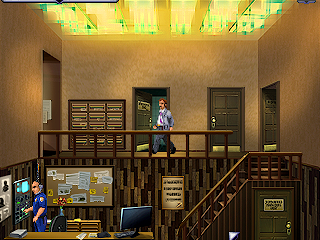 However this low resolution sprite style can occasionally lead to players missing something important just because it simply did not stand out enough in the environment or by being completely obstructed from view by another main character. Fortunately unlike other games in the genre, Resonance keeps this flaw to an absolute minimum by being more flexible with the use of the previously mentioned multiple solutions. Resonance is complimented by some fantastic spoken dialogue which is delivered extremely well by the voice cast. Occasionally some deliveries can border on the edge of being more comical than effective but for the most part remains fairly consistent. The tension of the overall setting is given greater presence thanks to a simple yet haunting soundtrack that sits neatly on top of the exemplary presentation. These melodies are by no means anthems but they do a fantastic job of keeping the mood without feeling repetitive or causing un-necessary frustration to the player. Resonance is a lovingly created homage to one of the greatest gaming genres of all time while leaving a truly unique identity of its own. Dark, disturbing and very touching, Resonance will toy with your emotions but will leave you with a great sense of satisfaction at the end. If this game is an example of what can still be achieved with the genre then the point and click adventure has a very bright future indeed.